It is an eye disorder which results in thinning of the cornea. The patient mostly complaint of blurry vision, double vision, nearsightedness , astigmatism and sensitivity to light and in some severe cases scarring or circle maybe seen within the cornea. Usually both eyes are affected, there is no specific cause for the disease but it is widely believed that the combination of Genetics, Environment and Hormonal factors play an important role in the development of Keratoconus. Eye refraction: In this test a special equipment is used that measures your eyes to check for vision problems. Patient look through a device that contains wheels of different lenses (Phoropter) to help judge which combination gives you the sharpest vision, a hand-held instrument Retinoscope) may also be used to evaluate refraction of the eye. Slit-lamp examination: In this test a vertical beam of light on the surface of your eye is directed and uses a low-powered microscope to view your eye. Doctor evaluates the shape of your cornea and looks for other potential problems in your eye. The doctor may repeat the test after you have had eye drops applied to dilate your pupils. This helps with viewing the back of your eye. Keratometry: In this test your eye doctor focuses a circle of light on your cornea and measures the reflection to determine the basic shape of your cornea. 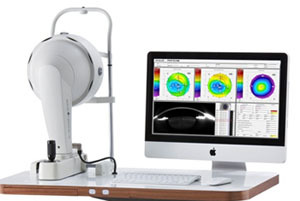 Computerized corneal mapping: Photographic tests, such as optical coherence tomography and corneal topography, records images of your cornea to create a detailed shape of your corneas surface which can also measure the thickness of your cornea. 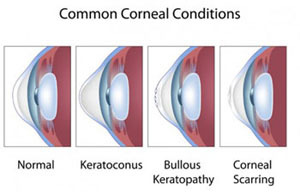 Corneal Cross linking is a developing treatment for Keratoconus and other corneal diseases. Cross linking helps in strengthening the cornea of the eye.